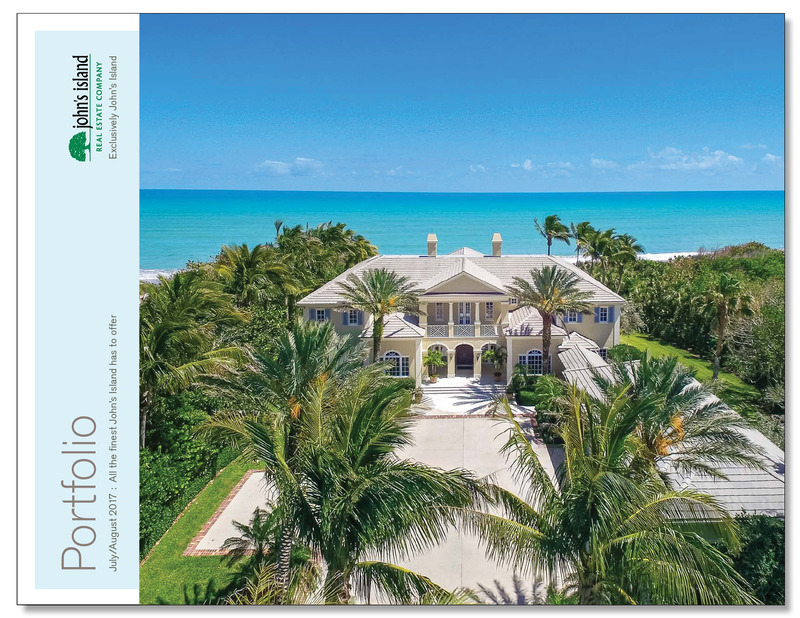 Featured on our March/April 2019 Portfolio cover is a majestic, award-winning 4BR oceanfront jewel, poised on 130± feet of pristine shores. Portfolio Jan/Feb showcases on its cover a spectacular, renovated 4BR/5.5BA waterfront property surrounded by breathtaking, panoramic views of John’s Island Sound with nearly 210’ of direct water frontage and direct Intracoastal access. 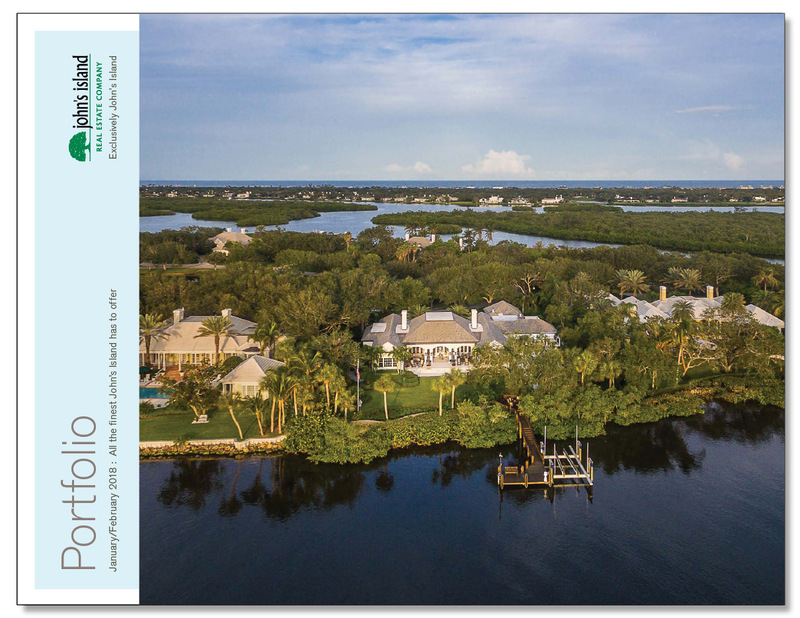 Portfolio (November/December 2018) issue showcases a new listing located along a private area near the Intracoastal. Sited at the end of a quiet cul-de-sac on .72± acres, this gorgeous 4BR+Study/4.5BA lakefront residence enjoys spectacular sunrise and water views from all principal rooms. Portfolio July/August issue showcases an impressive, redesigned, 3-bedroom oceanfront condominium overlooking stunning ocean views. Designed by Harry Howle Architects and Croom Construction. Portfolio May/June issue highlights an impressive 6-bedroom home with desirable southern exposure and captivating water views of the sparkling infinity-edge pool and tranquil lake. 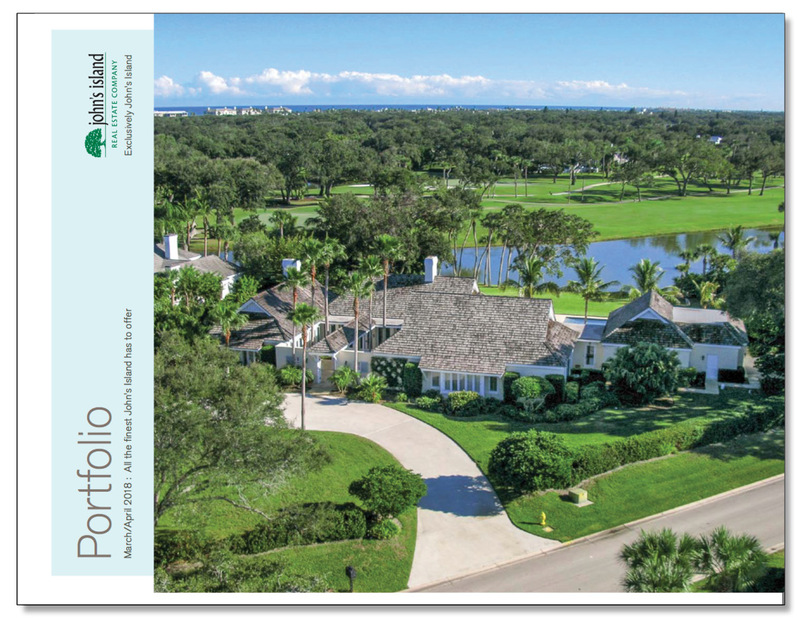 Portfolio March/April issue showcases a remarkable 6-bedroom residence sited on a private double-lot overlooking gorgeous, multiple fairway and lake views of the South Course. John's Island Real Estate Company, a market leader in luxury real estate, is pleased to announce the addition of Susie Perticone to their dynamic sales team as the company experiences continued growth and success. Perticone holds a GRI license (Graduate, Realtor Institute), a distinction earned from the National Association of Realtors (NARS), and has been a top producer for nearly five years. 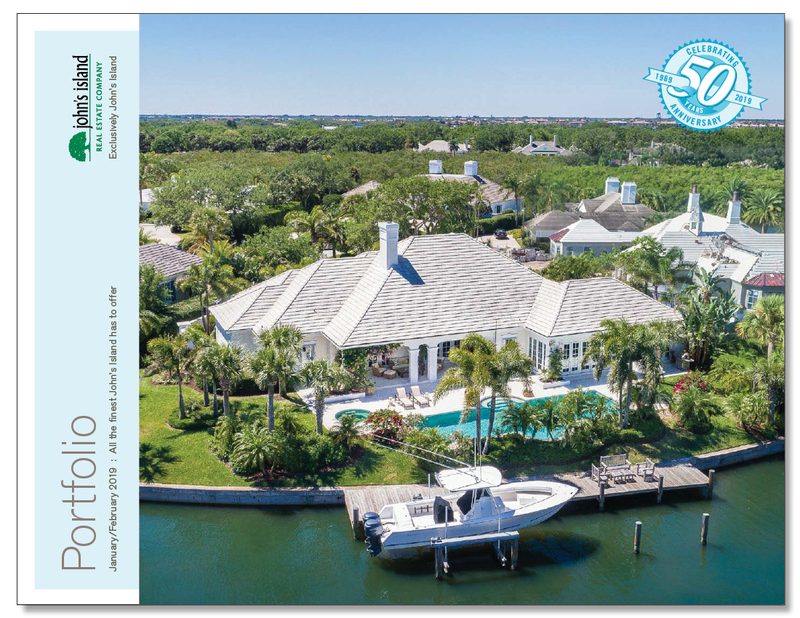 Portfolio January/February issue features on its cover a luxurious, 5BR/6.5BA waterfront property offering 130± of river frontage, breathtaking views, Intracoastal waterway access and boat dock. 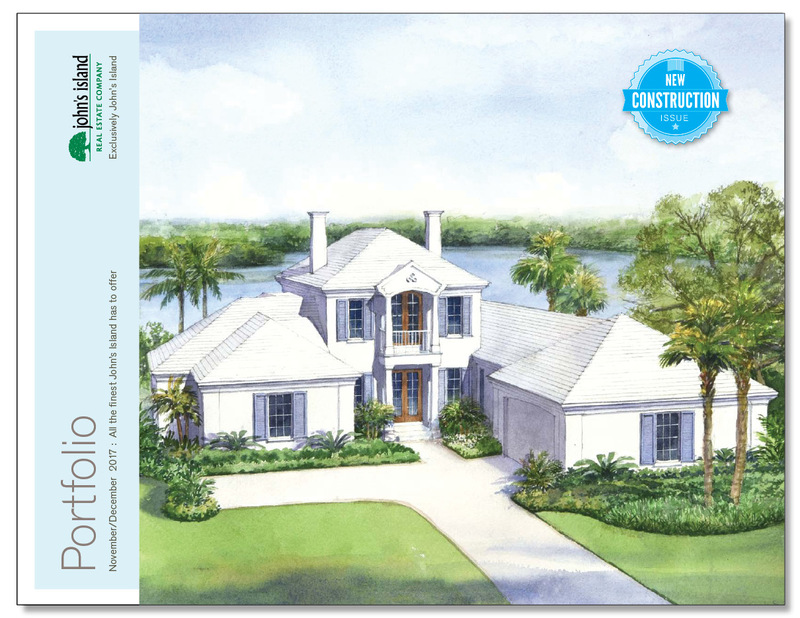 Portfolio November/December issue highlights our New Construction homes. On the cover is a gorgeous 4BR/6.5BA waterfront home that maximizes the .48± acre bulkhead lot with stunning, panoramic views of John's Island Sound. OUR OFFICE WILL BE OPEN WEDNESDAY, SEPTEMBER 13! Based on the current forecast of Hurricane Irma, our real estate office will be closed Friday, Saturday, Sunday and Monday as well as John’s Island Club. The current projections have us under the probability cone for this weekend. All announcements regarding Hurricane Irma and Club functions will be posted on the John’s Island website (Club members only) at www.JohnsIslandClub.org. Portfolio (September/October) showcases a desirable 4BR/5BA courtyard home just steps from the beach featuring a gorgeous pool, peaceful tropical garden, bright and airy living spaces, cabana, and a 2-car garage. Everyone’s idea of a perfect day at John’s Island is different, but we’re here to help you attain the perfect JI experience! Whether you’re teeing off on the challenging West Course, enjoying a tennis match, or simply relaxing and having fun with your family and friends, we’ve got everything you need to get you there! View this enticing, short video and share it with your friends. 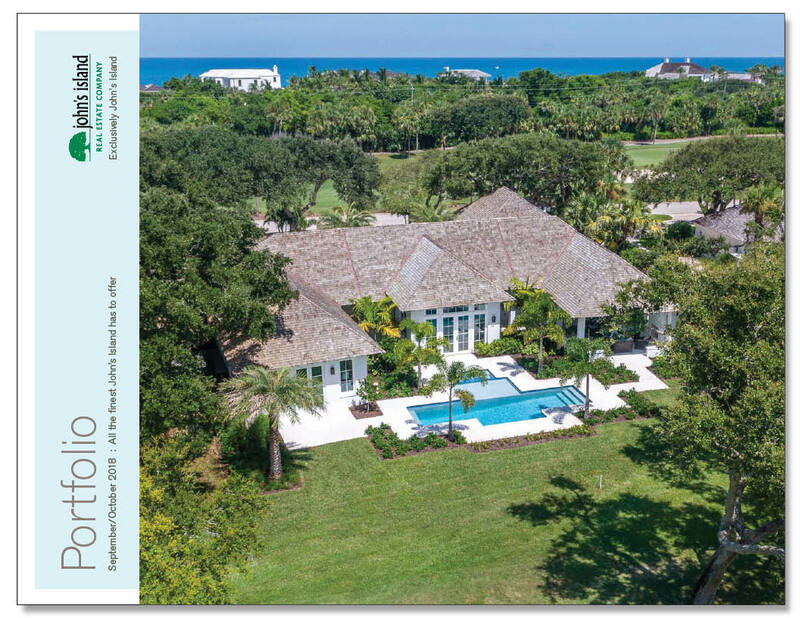 Portfolio (July/August) issue features a breathtaking and private 5-bedroom oceanfront retreat showcasing incredible ocean views, soothing tropical breezes, brilliant sunrises and exceptional indoor/outdoor living. Portfolio (May/June) features an exceptional 5BR architectural masterpiece with private outdoor living areas centered around a tropically landscaped pool. Portfolio (March/April) issue features an exceptionally renovated 4-bedroom retreat overlooking serene views of Indian Lake. Custom finishes, beamed T&G ceilings, beautiful millwork, a large center island kitchen and bonus theater room with bar are sure to please. John’s Island Real Estate Company is proud to host their 3rd annual JIRE 5K Rabbit Run/Walk to be held on Good Friday, April 14. Rain or shine, this family-friendly event for all ages promises good fun, friends, food, music and Easter cheer. All of the proceeds will benefit the John’s Island Community Service League. 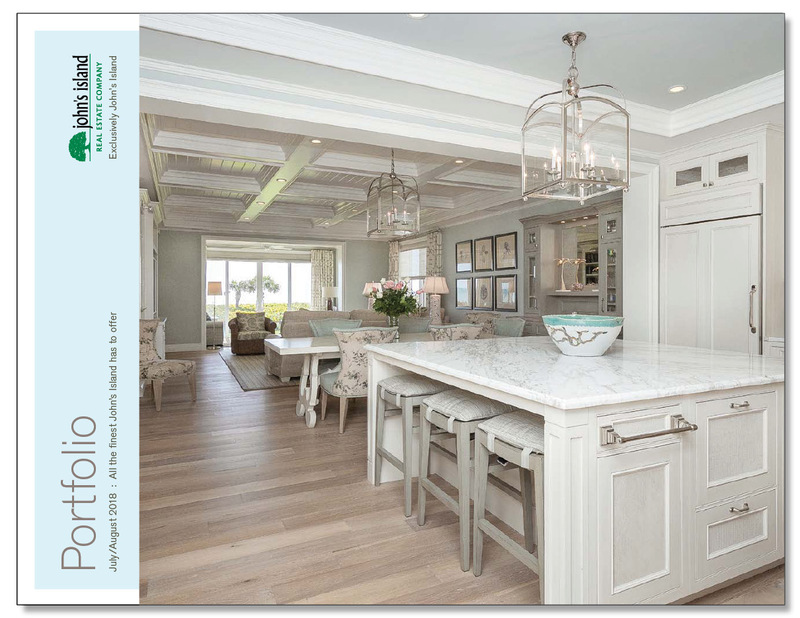 This issue features a beautifully renovated 4-bedroom, waterfront retreat overlooking private John's Island Sound views. A boat dock with lift, large yard with pool and luxurious appointments compliment this 6,522± GSF home. 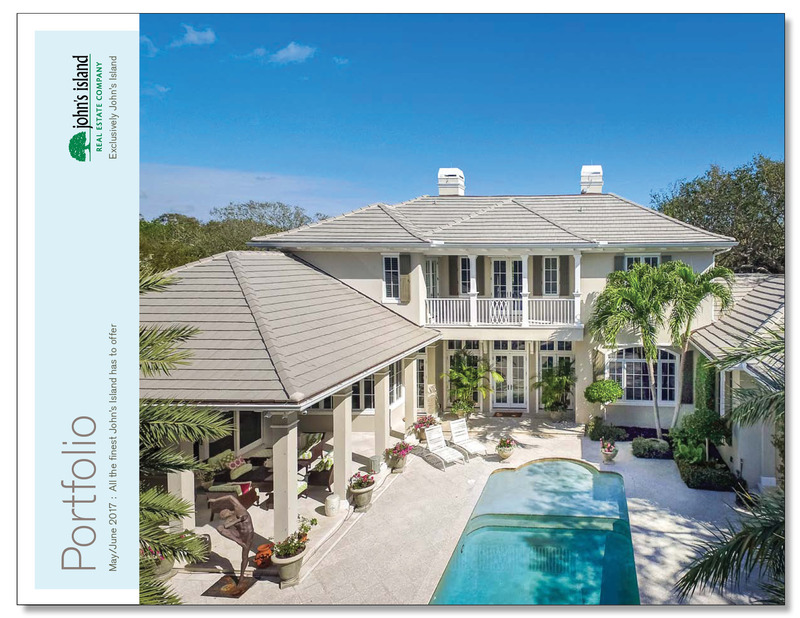 Portfolio (November/December) issue features a gorgeous 5-bedroom, West Indies style home nestled along John's Island Sound. Beautifully designed for indoor/outdoor living, the peaceful location and exceptional water views are sure to please. SATURDAY UPDATE: Important News from John's Island Club -The Beach Club & Golf Club have regained power this afternoon. Lunch and Dinner Service at the Beach Club is back to normal operations. The pool is clean and beach has full access. Tomorrow Fitness will reopen and Golf & Tennis will announce their reopening schedules. Portfolio (September/October) issue features a timeless 4BR/6.5BA lakefront retreat overlooking peaceful lake views. Lushly landscaped grounds enhance the tropical pool with fountain and spa, and provide the perfect backdrop to all principle rooms. 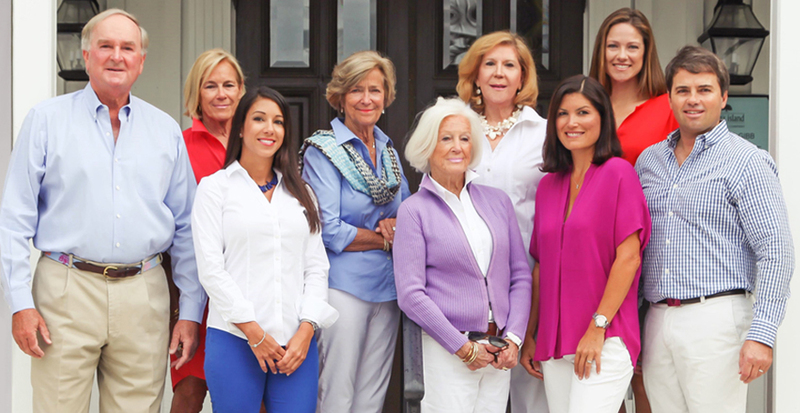 John's Island Real Estate Company recently announced a record $32+ Million in sales for the month of July. Bob Gibb, Owner/Broker of John’s Island Real Estate Company (JIRE), attributes their success to the company’s dedicated, expert, sales executives, robust website, ambitious national and international marketing strategies and exceptional clients. Portfolio (July/August) issue features an impressive, luxurious 6BR/6.5BA oceanfront “smart home” built with the finest quality construction and attention to detail. Conveniently located on a no-thru street near the south tennis courts, squash courts and south gate, this commanding 11,311± GSF home ascends majestically from its tropical surroundings offering 125-feet of ocean frontage. A recent article published by The Huffington Post gave Vero Beach rave reviews when it comes to discovering new pleasures in this unspoiled corner of Florida. Though classified as a city, Vero, with a strict policy that no building can exceed four stories, is a rare place offering a world-class museum, top shelf street shopping, scenic natural wonders and the best beaches south of Georgia. 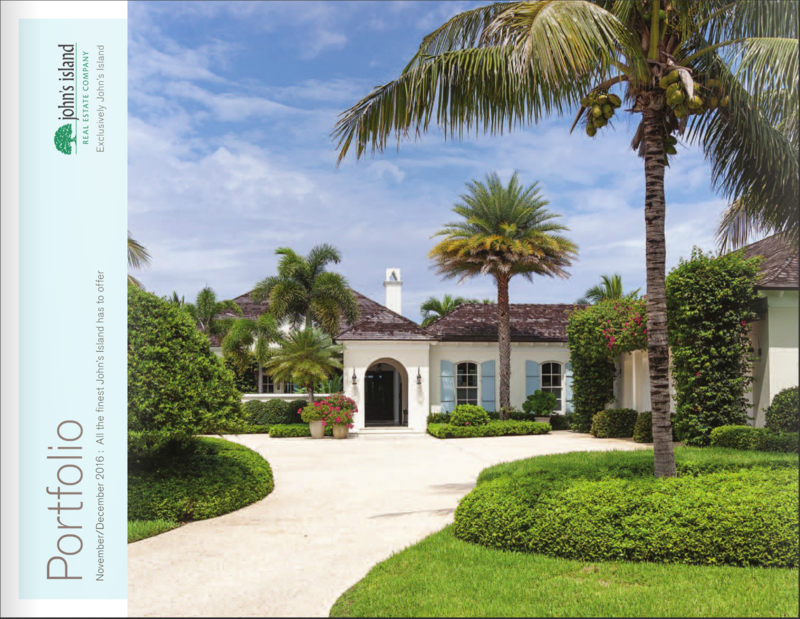 Portfolio (May/June) issue features stunning 4BR waterfront retreat inspired by the late Addison Mizner, an American resort architect whos Mediterranean Revival and Spanish Colonial Revival buildings, left an indelible stamp on Palm Beach and other South Florida locales. A dock, unobstructed water views and the opportunity to entertain al fresco are irresistible. The Blue Angels are returning to Vero Beach on Saturday, June 25 and Sunday, June 26 for another spectacular performance! John's Island Real Estate Company is proud to support the biggest and best event on the Treasure Coast, where more than 50,000 people attended the performance of this amazing jet team at the 2014 show. Now through May 20, John’s Island Real Estate Company will be collecting unopened, shelf-stable food items to help United Against Poverty (UP) of Indian River County. Seasonal residents planning to clean out their pantries before leaving for the summer, or full-time residents who are reorganizing their pantries, can help our local families in need by supporting UP’s efforts to bridge the hunger gap that exists for the families of over 10,000 school-age children in Indian River County. 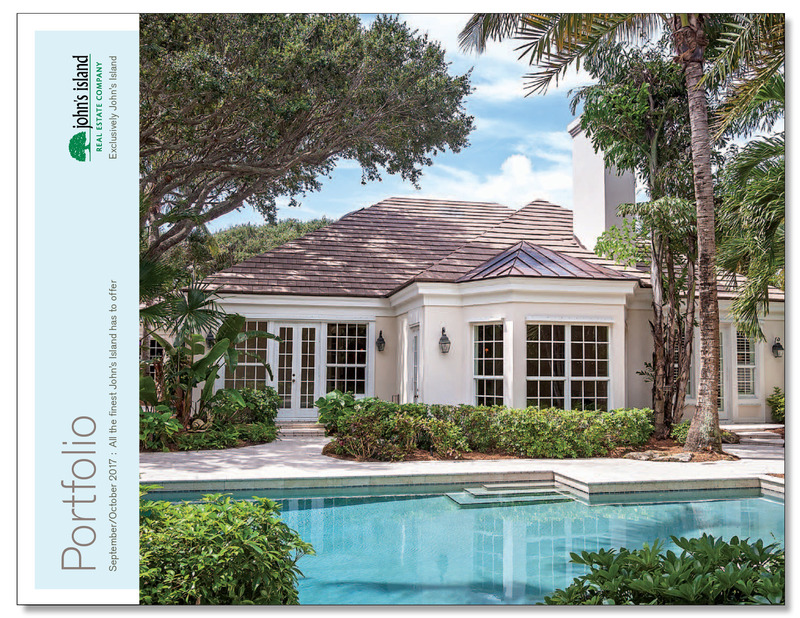 Portfolio (March/April) issue showcases an exquisitely renovated, 5-bedroom retreat designed for indoor/outdoor living. Portfolio (January/February) features an exceptional 4BR retreat overlooking breathtaking Indian River views. Portfolio (November/December) features a desirable 3BR+Study/3.5BA courtyard home located in the quaint seaside setting of Oceanside Village, just steps to the beach! LINKS magazine features John's Island Club's lauded West Course, home to the U.S Mid-Amateur Championship in October. Designed by Tom Fazio, the West Course is anything but a stroll in the park. LINKS editor and John's Island Club member, George Peper, wrote daily reports covering the highlights of the event as well as the beautifully written article as seen on page 60 of the current issue. A timely ace on a par-4 led to Sammy Schmitz defeating Marc Dull, 3 and 2, in the championship match to win the 35th U.S. Mid-Amateur on the 6,855-yard, par-72 West Course at John's Island Club in Vero Beach, Fla. Earning his first USGA title and a likely invite to the Masters, it was the first hole-in-one on a par-4 in a USGA amateur competition since Derek Ernst's ace in 2011. Portfolio (September/October) features a desirable 3BR/3.5BA residence showcasing peaceful Indian Lake views. On the heels of a banner year, John’s Island Real Estate Company has followed up with a highly anticipated office remodel. Through many years of success, added staff and an ever-changing market, John’s Island Real Estate Company is evolving alongside John's Island. The fresh, new look reflects the the vitality of John's Island, all while keeping their office doors open. The renovation will be completed by the middle of October. A special thank you to Bryant Construction and Rob Atkins Architecture for making our offices look great! Portfolio (July/August) features an exceptional oceanfront retreat affording panoramic views of ocean and sky. Portfolio (May/June) features a stately 4BR/4.5BA waterfront home commanding unparalleled views of John's Island Sound. John’s Island Real Estate Company, exclusively serving John’s Island, is off to a remarkable start this year, with first quarter sales double that of 2013. With 23 properties placed under contract in the past two weeks, John’s Island Real Estate Company is on its way to hitting historical highs in sales. Despite a lag in housing overall, JIRE has sold or placed under contract 67% more properties than this time last year. Portfolio (March/April) features a masterfully designed 5BR/6.5BA estate sited on one of the highest lots in John’s Island, showcasing unsurpassed, panoramic ocean views. John's Island Club is the host of this year's U.S. Mid-Amateur Championship, a tournament of the United States Golf Association (USGA). The U.S. Mid-Amateur Championship is scheduled for October 1 – 8, 2015, with stroke-play qualifying and match play on the Tom Fazio designed West Course and stroke-play on the Pete Dye designed North Course. Click here for details! Portfolio V19N1 kick's off the new year featuring a season with a desirable and private 3BR/3.5BA oceanfront residence poised high above the shoreline on .89± acres, capturing spectacular, panoramic ocean views. Portfolio V18N6 features a stunning six-bedroom, oceanfront estate perfectly sited on 1.6± acres with 130 feet of direct ocean frontage. John's Island Real Estate Company is proud to announce their nomination in two distinct categories, 'Best Website' and 'Best Print Marketing' at the 19th annual Who's Who in Luxury Real Estate Fall Conference in Boston this October. Hosted by Luxury Real Estate Chairman/Publisher, John Brian Losh, it is one of four annual invitation-only events that bring together the most prominent luxury brokers from across the globe to discuss current real estate trends. The current edition of LINKS Magazine contains an exceptionally written, 20-page supplement showcasing John's Island. John's Island Club member and current Editor of LINKS Magazine, George Peper, also former Editor of Golf Magazine, brilliantly wrote about life at John's Island, its legendary family-oriented lifestyle, and unique world-class amenities. Copies are available at the John's Island Real Estate Company sales office, or simply click here to view the on-line version. Portfolio V18N5 showcases a beautifully renovated residence, located at 610 Coconut Palm Lane, showcasing breathtaking, unrestricted water views of John's Island Sound. Indian River Shores, an incorporated municipality where John's Island is located adjacent to Vero Beach, ranks most affluent town in Florida according to a recent article by Andy Kiersz with Business Insider. These are either legally incorporated cities or towns or Census-designated statistical equivalents. In this map, we consider places with at least 1,000 residents, according to the 2008-2012 American Community Survey. Housing markets with the highest percentage of resident CEOs and legislators were identified by the U.S. Census Bureau according to a recent article by The Wall Street Journal . Five of the ten top spots are in Florida, including the Vero Beach market ranking #3. Portfolio V18N4 showcases a NEW CONSTRUCTION residence at 391 Llwyd's Lane, built by Croom Construction and perfectly designed by Harry Gandy Howle Architect & Associates. The Town of Indian River Shores’ 1990 Pierce Telesquirt pumper truck was recently given to the Indian River State College for training – but not at taxpayer expense. John’s Island Real Estate Company stepped up to purchase and donate it, on behalf of the Town, for the estimated $5,000 it might garner via an online auction upon hearing that they wanted to recoup some of the value instead of donating it to the college’s public safety training academy in Fort Pierce. Portfolio V18N3 features is 475 Coconut Palm Road, a remarkable riverfront estate commanding unparalleled mile-wide views of the Intracoastal Waterway. JIRE record-breaking 32963 riverfront sale! John's Island – Vero Beach, Florida: John's Island Real Estate Company recently sold an exceptional riverfront home last offered at $9,6000,000. This is a record-breaking sale along the river in the 32963 area. Extraordinarily detailed and designed with unsurpassed features, this 5BR/8.5BA estate boasts the highest level of craftsmanship. The desirable waterfront location along Gem Island commands private, sweeping views of the Intracoastal Waterway. For the second year in a row, John’s Island Real Estate Company is proud to sponsor the 2014 John’s Island Open, April 24-27. This history-making event, hosted by the John's Island Club, features 16 of the world's best women squash players competing for the WDSA's top prize. A Pro-Am is scheduled, giving members the chance to team up with the ladies and put their skills to test. Culinary Institute of America graduate, John Farnsworth, set a new record last Easter, serving 4,000 meals. John's Island Club executive chef John Farnsworth, once named to Food & Wine magazine's 'Ten Best New Chefs in America' spend the last 18 years overseeing a staff of 127 at John's Island. His attention to detail is proven by the numbers. According to a recent article in the Vero Beach 32963, one of the things powering the barrier island real estate market is the emergence of Vero Beach as 'The Hamptons of Florida' – so say island realtors, Miami residents who decompress here on weekends and The Palm Beach Post, among others. A Wall Street Journal article that takes up the theme is rumored to be in the works. Read the full article here. Portfolio V18N2 features 90 Tortoise Way, an exceptional contemporary 3BR/5.5BA riverfront estate designed by the noted architect Norman Jaffe. The Washington Post recently analyzed data from all 43,000 U.S. zip codes to find the areas where people rank highest in a combination of income and education, and 32963 came out in the top 5 percent of postal zones known as Super Zips. Afterwards, they also confirmed that the John's Island Club ranked 2nd best Residential Club! Click for full article here. Portfolio V18N1 is available here. 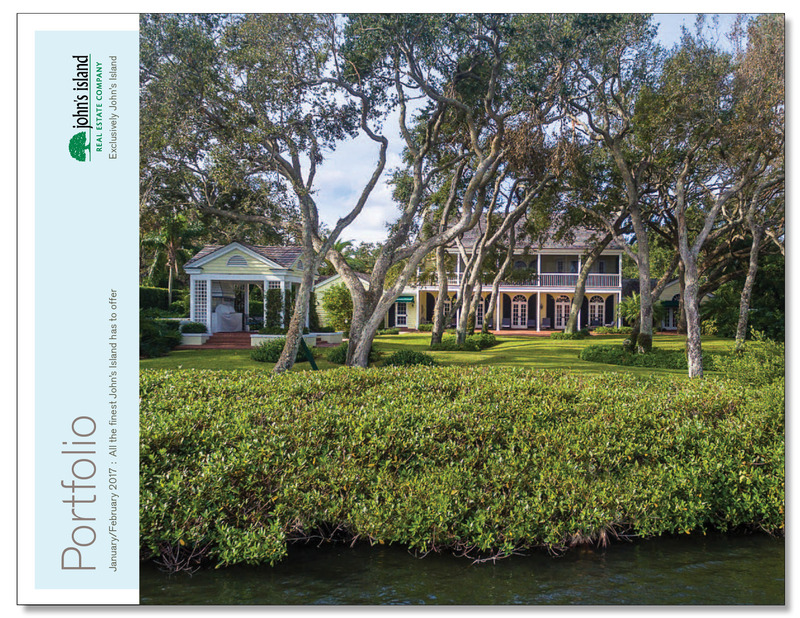 This issue features 21 Dove Plum Road, a magnificent 3BR/3BA riverfront residence commanding one of the best Indian River views available in John's Island. November was a record month, since our inception in 1969, with 35 properties sold/under contract! This resulted in a diminishing inventory from 146 listings at the beginning of the year to 93 today – a 37% drop. Currently, 7% of our market is for sale, down from almost 13%. With all of the recent activity, buyers are realizing now is the time to take advantage of the attractive values and supply still available. A sense of urgency that has been missing for the past few years has come back into the market. John’s Island Real Estate Company is pleased to announce a record number of properties were placed under contract in the month of November. It has been one of their busiest times for sales, with a total of 94 properties sold/under contract since January 2013. They are seeing a decrease in their inventory as buyers are coming back into the market that have been reluctant to buy in the past. Portfolio V17N6 available here. This issue features 120 South Shore Circle, a beautifully renovated four-bedroom residence neslted along the Indian River, on a quiet secluded cul-de-sac, with incredible water views from nearly every room. A highly anticipated "Invite Your Friends" weekend, held by the John's Island Club, alongside the John's Island Real Estate Company's Open Houses have lead to 7 properties placed under contract over the past few days. "I've never seen so much anticipation and excitement for the start of a season as I'm seeing this year." states Bob Gibb, Chairman/Broker of John's Island Real Estate Company. Each year, members and their guests enjoy reuniting with old friends, the world-class amenities and near perfect weather surrounding the Opening Weekend festivities which kicks off this Friday. JIRE partners with luxury brand Taviers.com! John's Island Real Estate Company is pleased to announce their newest partnership with Taviers.com – a premiere international luxury marketplace offering an array of products and properties, as well as expert advice on all things luxury. Check out their beautiful website, http://www.taviers.com, for more information. Our luxury listings will be showcased throughout their estates section. Portfolio V17N5 available here. This issue features 228 Island Creek Drive, an exquisite 4BR/4.5BA residence showcasing one of the most spectacular fairway and lake views of the South Course. Portfolio V17N4 available here. 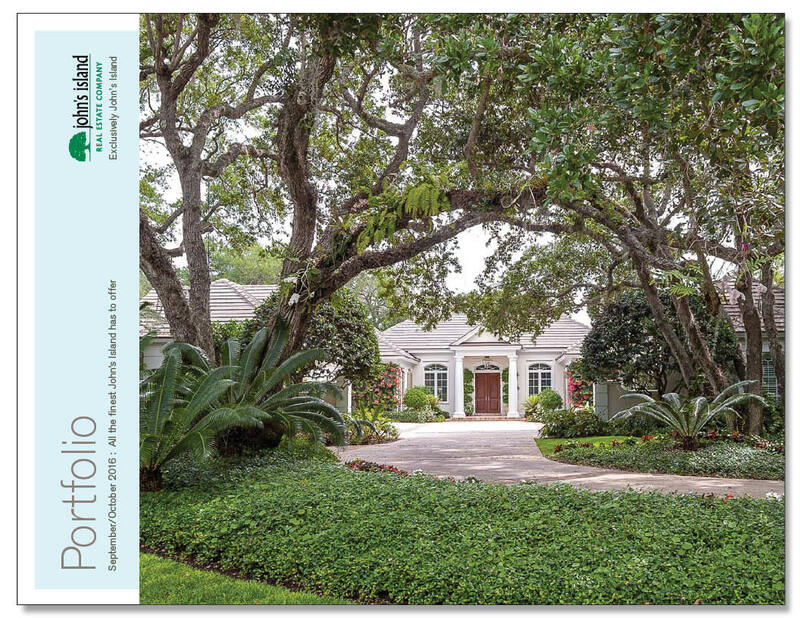 This issue features 560 Sea Oak Drive, a recently built 3BR/4.5BA residence nestled along a private stretch of the North Course. Portfolio V17N3 available here. 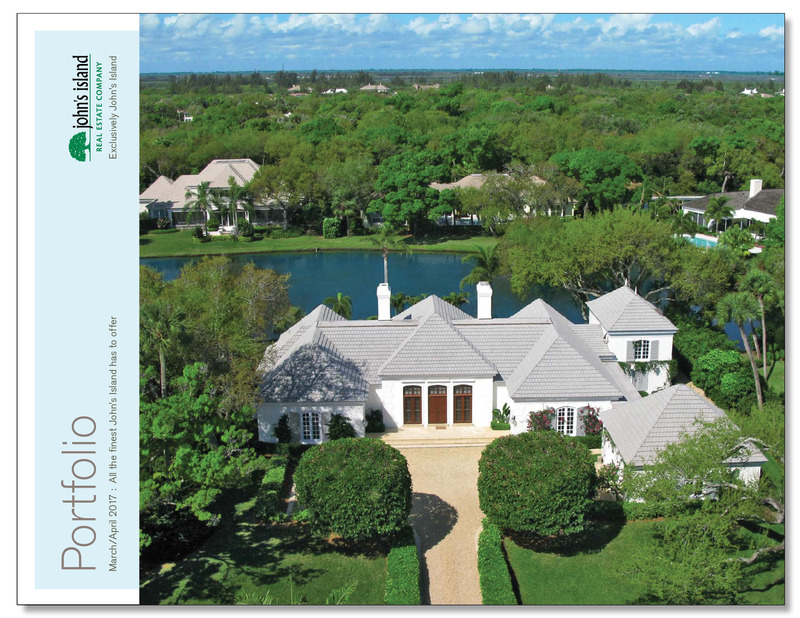 This issue features 350 Sabal Palm Lane, a 2-story 4BR/5BA home on a large .7± acre lot located on a cul-de-sac street. Privacy is paramount. TheUnited States Golf Association (USGA) today announced John’s Island Club, in Vero Beach, Fla., as the host site for the 2015 U.S. Mid-Amateur Championship. This will be the first USGA championship held at John’s Island Club. The dates of the championship are Oct. 1-8. John’s Island Real Estate Company is proud to sponsor the first-ever 2013 John’s Island Open from April 18-21. This history-making event, hosted by the John's Island Club, features professional squash matches from the top eight doubles teams on the Women's Doubles Squash Association (WDSA) tour. Once again, John's Island Real Estate Company proudly supports the John's Island Community Service League (JICSL) as the Grand Sponsor of their annual Spring Gala. This year, the Beach Club turned into the most glamorous place in the world, The El Morocco Club. The year is 1943. The place; New York City. Their generous donation assists the JICSL to raise funds for local distribution to charitable agencies in Indian River County concerned with the health, education and human services primarily of women, children and families in need. Portfolio V17N2 available here. 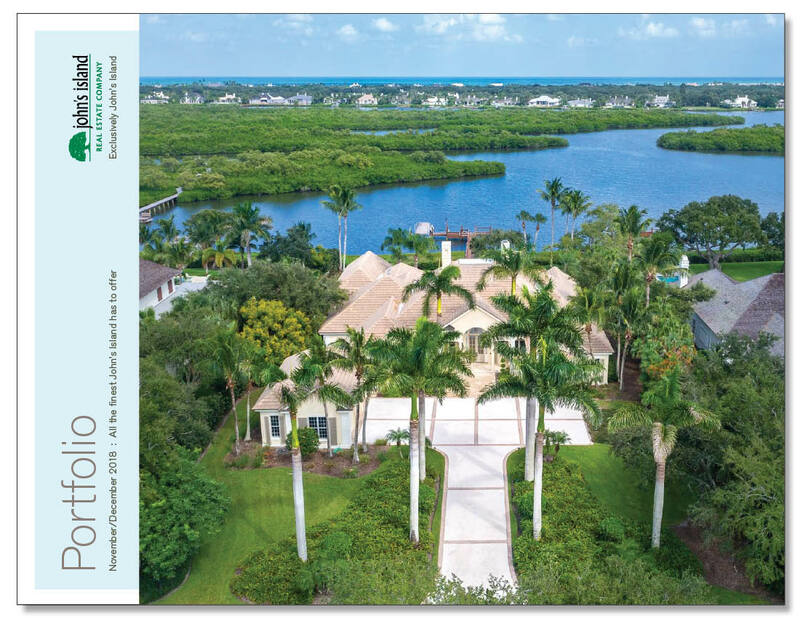 This issue features 275 Coconut Palm Road, a gorgeous 4-bedroom residence featuring an expansive lanai overlooking beautiful Lake Reams - perfect for entertaining! Just reduced! Portfolio V17N1 is available here. 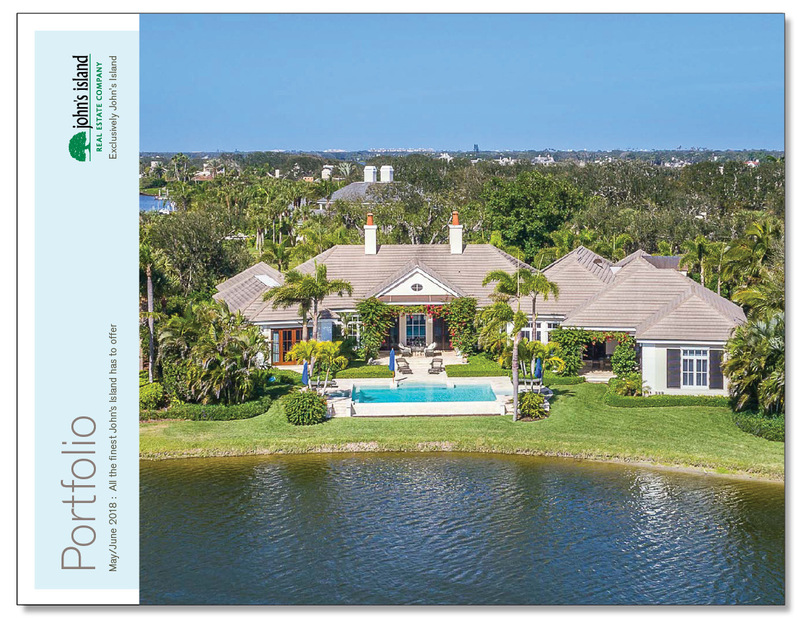 Featured on the cover of this issue is 402 Sabal Palm Lane, a beautiful 3BR/3BA residence ideally located near the south gate with expansive, multiple fairway and lake views of the South Golf Course. The annual Opening Weekend at John's Island is upon us. This highly anticipated event reunites families and long distance friends. While here, bring a friend to our Open House Tour featuring a wide selection of John's Island properties for sale. Currently we have 76 properties sold/under contract this year. Featured on the cover of this issue is a remarkable 5BR/8.5BA Gem Island riverfront masterpiece, nestled along the western shore of Gem Island on a quiet cul-de-sac street, with exceptional views of the Intracoastal Waterway. To download your digital edition of Portfolio V16N6 now, simply click here . As we come out of one of our busiest summers, John's Island Real Estate Company is pleased to report a 150% increase in sales in June and July over the same period last year. This increased activity reflects heightened buyer awareness of attractive home and condominium prices. Currently we have 72 properties sold or under contract this year. Featured on the cover of this issue is an architecturally distinguished, 3BR/3.5BA residence sited on a tree-lined cul-de-sac street overlooking stunning golf and water views. Happy 4th of July! This highly-anticipated, fun-filled week is one of John's Island's biggest celebrations, starting with the 9th annual Adventure Island Camp for kids followed by the 2nd annual Family Week. And of course the most amazing fireworks and food! We even have some real estate activity take place in and around all the celebrating. Since going to press on this issue, we now have 65 properties sold or under contract since January! John's Island Real Estate Company is overwhelmingly number one in John’s Island sales. With 57 properties sold or placed under contract this year, no other company comes close. John's Island Real Estate Company is pleased to announce six properties placed under contract during the Easter holiday. History has been made at the February 23, 2012 Indian River Shores Town Council meeting when long-time municipally active & JI resident was honored with a beautifully mounted Proclamation, as well as having 'Colonel Jack Mitchell Way' named after him. The newly named "Way" is that portion of Fred R. Tuerk Drive which turns North and leads to the John's Island (South) Gate. 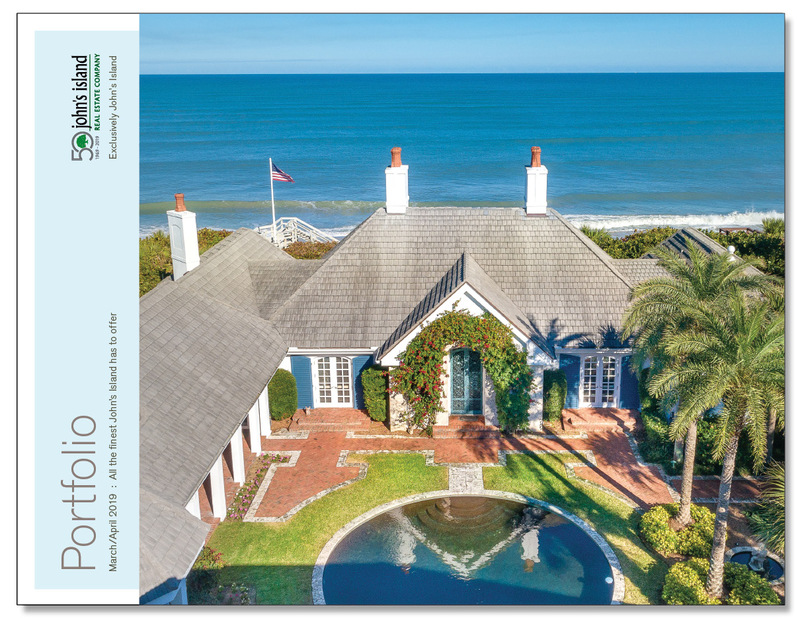 John's Island Real Estate Company (JIRE) is pleased to announce a recent article featuring JIRE in the winter 2012 edition of Florida LINKS Living Magazine. Learn more about John's Island, Florida through captivating images and descriptive writing including information about golf, family activities and more. Read the article in Florida LINKS Living Magazine. JIRE Proudly Announces All-Time Record Sales of $38 Million In One Month! John's Island Real Estate Company, the only on-site real estate company in the private community of John's Island, kicks off their season's opening weekend in November with $27 million in sales. Since January 2011, John's Island Real Estate Company has either sold or placed under contract 73 properties - a 12% increase over last year's total properties sold. Company Chairman, Bob Gibb, notes, "We are exclusively John's Island and the key to our success is our focus and relationships. It is encouraging to see strong results from Opening Weekend." The upcoming John's Island Opening Weekend is set to feature exciting new listings, price reductions, and open houses making November 3-5, 2011 a great time to explore John's Island real estate. Oceanfront real estate sales are heating up as fast as the late Spring temps, John's Island Real Estate Company reports. Seven properties were placed under contract around the second week of May alone - five of which were oceanfront properties. Since January 2011, John's Island Real Estate Company has either sold, or placed 55 properties under contract. More than half of those sales are oceanfront properties and in spite of the down economy in 2010, first quarter sales are up 67% over the same period last year-more than any competitor - in fact, no competitor even came close. Our first quarter sales show a 67% increase over the same period last year, tying it for our 2nd best quarter ever! With 43 properties sold or under contract since January 2011, John's Island Real Estate Company is off to one of its best first quarters ever. No other real estate company even comes close. Some sale prices were at levels we haven't seen in 10 years. We expect our sales to continue at the first quarter pace as buyers are realizing there are great values at these new prices. Welcome to the website of John's Island's most successful real estate company! For those returning to our site, you may notice is has changed. 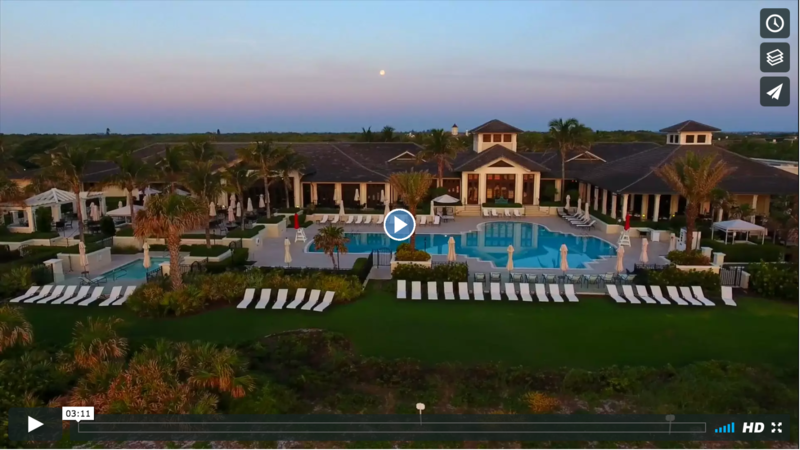 We are excited to have just launched our newly re-designed website showcasing the exquisite John's Island lifestyle and resort-like amenities in a visually stimulating, user-friendly setting. On November 11-14, the 5th Annual John's Island Club Squash Invitational once again provides fast squash doubles competition for four days at the John's Island Club Doubles Squash Court. This world-class action, featuring both men and women players, begins on Friday and continues throughout the weekend with finals on Sunday morning. For specific schedule of play, call the Tennis Pro Shop at (772) 231-1220. For the second consecutive year, John's Island Real Estate Company has been selected for the 2010 Best of Vero Beach Award in the Real Estate Rental Service category by the U.S. Commerce Association (USCA). On November 14, John’s Island, a private gated residential community in Florida, celebrates their opening weekend with highly-anticipated festivities to kick off their high season to welcome back families and their guests. John’s Island, a quaint seaside community located just north of Vero Beach, notably combines the flawless beauty of the tropics with the architectural beauty of a country club community. This 1650-acre barrier island is a membership-only, residential community that includes access to an exquisite beach club, sporting clubs and a lifestyle of casual but sophisticated luxury. The Fresh Market Opens In Vero Beach August 26! The Fresh Market, a chain of gourmet supermarkets based in North Carolina, will make its Treasure Coast debut Aug. 26 when it opens a store at Miracle Mile in Vero Beach just south of John's Island. Gene Baxley Schwiers, director of recruiting and human resources at The Fresh Market, said the company is excited about opening its first Treasure Coast location. “Everyone here has been very welcoming,” Schwiers said. John's Island Real Estate Company has been selected for the 2009 Best of Vero Beach Award in the Real Estate Rental Service category by the U.S. Commerce Association (USCA), a Washington D.C. based organization established to recognize the best of local businesses in their community. VERO BEACH, Fla.- The nation’s leading cardiothoracic surgery organization-the Society of Thoracic Surgeons (STS)-has awarded its highest quality achievement rating to The Heart Center at Indian River Medical Center, recognizing it as one of the top heart centers in the United States. More than 900 hospitals, including America’s leading academic medical centers and most respected cardiac hospitals, voluntarily submit their cardiac surgery outcomes for analysis. For 2008, The Heart Center ranked among only 15 percent of programs nationwide to receive STS’s highest rating of "Three-Stars." The Treasure Coast community, known for its reputation as a haven for the uber-rich, has been featured in two prominent national media outlets, one of which is the Wall Street Journal. On Saturday, it published a glowing travel piece on Vero Beach featuring its local beaches, outdoor activities, the famous John’s Island community and Gloria Estefan’s Costa d’Este resort. The story touted the region as a quiet getaway for the wealthy — away from the flashy glitz of Miami and Palm Beach County. The Miami Herald recently ran a feature on Vero Beach featuring Gloria Estefan's new hotel, which is scheduled to open in June 2008, as well as recent expansions to the Riverside Theatre, which hosts performances and speakers like businessman Steve Forbes and comedian Paula Poundstone, and Vero Beach Museum of Art, currently hosting an exhibition of portraits by John Singer Sargent, Alex Katz, and other American artists. Vero Beach, FL - John's Island Real Estate Company was recently selected to join Residence, LLC as the exclusive real estate company representing the Vero Beach area of Florida. John's Island Real Estate Company and Mr. Robert Gibb, Broker/Chairman, were recently selected as the Outstanding Corporate Philanthropist winner for the 2005 National Philanthropy Day Awards. John's Island Real Estate Company Unveils Two Turtles for TurtleTrax! Vero Beach, FL - The Johns Island Real Estate Company is pleased to be the Presenting Sponsor of TurtleTrax© an exciting new charity event to benefit the Mental Health Association of Indian River County. What is 12 + 17?